At the Pan American Development Foundation, a 501 (c) (3) tax-exempt organization, we take pride in our financial efficiency and sound accounting practices. As part of our effort to maximize the value of every dollar we receive, we carefully monitor and review programs and costs, use donations and grants for their intended purposes, and look for ways to leverage funds for maximum impact. In addition, we continually work to strive to keep our overhead rate low. In 2017, 92.5% percent of our expended resources were used to implement programs that benefitted children, families, and communities in need in Latin America and the Caribbean. In addition, 6.5% percent was used for management and general expenditures, and 1 percent was used for fundraising. We are proud to say that PADF's financial practices conform to the highest accounting and financial standards. Our effectiveness has earned the trust and support of thousands of donors, corporations, governments, institutions and agencies throughout the Western Hemisphere and abroad. PADF is certified as a Partner in Trust by Guidestar, and has been awarded a Seal of Excellence by InterAction, the largest alliance of U.S-based international non-governmental organizations (NGOs). 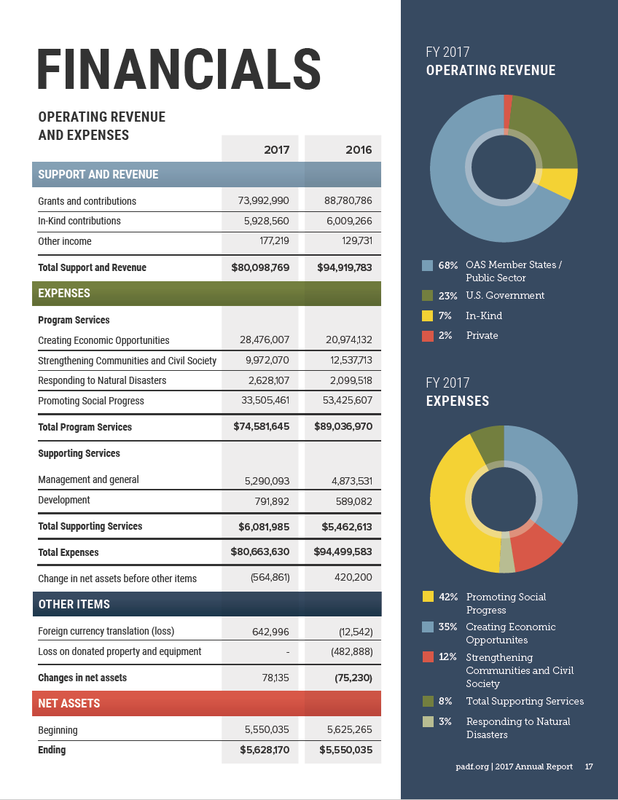 Every year, PADF provides a financial statement from a certified independent auditor as a part of our Annual Report. We also make available detailed financial information on the Form 990, which tax-exempt organizations file annually with the U.S. Internal Revenue Service.